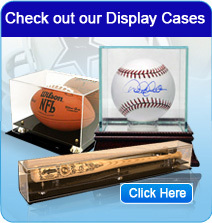 www.AutographWarehouse.com is one of the industry's largest memorabilia websites with over 70,000 authentic Autographed Sports Memorabilia & Autographed Celebrity Memorabilia items. Autograph Warehouse prides itself on having the widest variety of signed memorabilia offered in the industry at great prices! All our autographs are fully certified with dual matching holograms on both the item and the Certificate of Authenticity. Baseball Fans: We have autographed baseballs from the hottest players Mike Trout, Felix Hernandez, Jose Bautista, David Wright, Matt Kemp, Albert Pujols, Josh Hamilton, Joey Votto, Justin Verlander, and hundreds of legends like Reggie Jackson, Stan Musial, Ted Williams, or how about a Babe Ruth or Hank Greenberg PSA DNA or JSA Authenticated baseball. Autographwarehouse offers great signed photos Derek Jeter diving into the stands, Willie Mays 1954 World Series Catch, Mookie Wilson and Bill Buckner autographed 1986 World Series Game 6 moment, hundreds more, and of course we offer framing and matting at the best prices in the industry. And over 30,000 autographed baseball cards from stars like Wade Boggs to tough signed cards to find like Luis Tiant, Kirk Gibson, Ted Simmons, Larry Walker, Chris Sabo, or new stars like Bryce Harper and Paul Goldschmidt. Basketball Fans: We sell photos jerseys and basketballs from the stars of yesterday and today: Kevin Durant, Dirk Nowitzki, Larry Bird, Dwayne Wade, The Los Angeles Lakers Dynasty heroes Jerry West, Kareem Abdul Jabbar, Shaquille O Neal Magic Johnson, Kobe Bryant and the red hot New York Knicks like 1970 team autographed basketballs, John Starks signed photo of the dunk versus the Chicago Bulls, Carmelo Anthony and Patrick Ewing. Lets not forget we carry Michael Jordan and Lebron James autographed jerseys, autographed basketballs, and autographed framed photos. Football Fans: Autographwarehouse carries thousands of mini helmets, full size helmets, NFL footballs, official jerseys, and photos signed by stars and legends like Adrian Peterson, Gale Sayers, Joe Flacco, Ray Lewis, Joe Namath, Troy Aikman, Walter Payton, Peyton Manning, Jim Brown and more. We also carry cool stuff like Vince Papale of Invincible movie fame signed Eagles jerseys and mini helmets, or the New York Giants legends Mark Bavaro, David Tyree signed Super Bowl catch photo, Phil Simms, Bill Parcells and LT Lawrence Taylor memorabilia. Hockey Fans: Mr Hockey Gordie Howe and the Great One Wayne Gretzky are 2 of our best sellers. Other best sellers from the rink include Sidney Crosby, Maurice Richard, Alexander Ovechkin, Bobby Orr, Tim Thomas, Phil Esposito, Bobby Hull, Henrik Lundqvist, Mark Messier and fan favorites like Adam Graves, Ron Hextall, Bobby Clarke, Patrick Roy, and Joe Sakic. We also have tons of celebrity signed memorabilia from Gilligans Island to Star Wars, or how about adding a Rat Pack framed masterpiece to your game room. We sell authentic autographed guitars from Slash of Guns N' Roses, Roger Daltry of the Who, and photos signed by Taylor Swift, Tom Cruise, Katy Perry, Denzel Washington and thousands more, Feel free to call Autograph Warehouse toll free at 866-662-9144. Did you mean to type, sports memorablia, sports memoribilia, autografs, sports memorbilia,?